The romantic Disney animated classic is getting the Diamond treatment in February and now you can check out some bonus clips for this release! As previously reported, Disney/Buena Vista says 'Lady and the Tramp: Diamond Edition' is coming to Blu-ray on February 7. Generations of fans have fallen in love with Disney's 15th animated masterpiece -- an irresistible song-filled adventure about Lady, a lovingly pampered cocker spaniel, and Tramp, a roguish mutt from across the tracks. When Aunt Sarah moves in with her devious felines Si and Am to baby-sit, the very protective Lady soon finds herself being fitted for the unthinkable -- a muzzle! In her bid for freedom, she meets and is charmed by Tramp, dog-about-town. Together with friends Jock, Trusty, and Peg, they share thrilling adventures on an enchanting evening as Lady learns what it means to be footloose and leash-free. Disney’s Blu-ray Diamond Collection represents The Walt Disney Studios’ most prestigious and treasured animated classics. Diamond Edition titles boast the highest level of picture and sound; feature groundbreaking, state-of-the-art immersive bonus content; and include unprecedented levels of interactivity, personalization and customization, made possible because of Blu-ray technology. 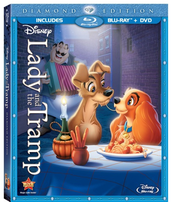 The Blu-ray/DVD combo pack will feature 1080p video, a DTS-HD Master Audio 7.1 soundtrack, and supplements include: Lady’s Pedigree: The Making of Lady and the Tramp; Finding Lady: The Art of the Storyboard; Original 1943 Storyboard Version of the Film; PuppyPedia: Going to the Dogs; “The Siamese Cat Song,” Finding a Voice for the Cats; “Bella Notte” Music Video; Trailers; and Excerpts from “Disneyland” TV Shows. Suggested list price for the Blu-ray/DVD combo pack is $39.99. You can find the latest specs for 'Lady and the Tramp: Diamond Edition' linked from our Blu-ray Release Schedule, where it is indexed under February 7.